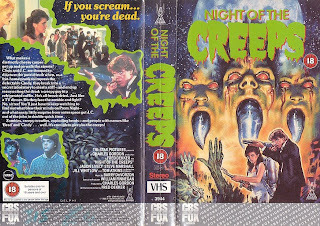 Detailed at Freddy in Space, Sony is letting the fans vote for the cover amongst a selection of three for their upcoming Night of the Creeps - Director's Cut DVD arriving October 20th. Option 1 is by far the best of the lot, despite not utilizing any of the three original poster designs for the film, conveying the campy throwback tone well and sorta looking like product from Shameless Entertainment. Option 2 looks too much like a 30 Days of Night graphic novel design and I'll be damned if Option 3 wasn't going to be cover if Sony didn't let us decide. Just an awful phoned-in piece of quickie Photoshop crap using a focal point (Pillsbury Doughboy alien) that's nearly inconsequential to the story. So thrill me, but why can't we have art like below?